As i go on i find more and more useful/fun scripts i can make and instead of creating a new thread for each one i will be trying to keep this thread updated with all the scripts i think you will enjoy. /filename.txt ooc "Large font is large"
Last edited by Glitchy; 07-03-2008 at 01:18 PM. Last edited by wowkid; 06-21-2008 at 09:52 PM. The first one doesn't work right. It posts all the script in the channel. Edit: Found the problem, delete everything before /chsay. I think you added that by mistake. Last edited by hoboonaparkbench; 06-21-2008 at 11:26 PM. Glitchy would you be able to make a link where if you click it, it does several commands, not just one? I wanted it to for example, write something and then do /minion_falling_down ? I'd also like to change the font type of the link that does 'IM A RETARD' to that HYBORIANLARGE one if that would be possible. Cheers for some nice scripts btw. 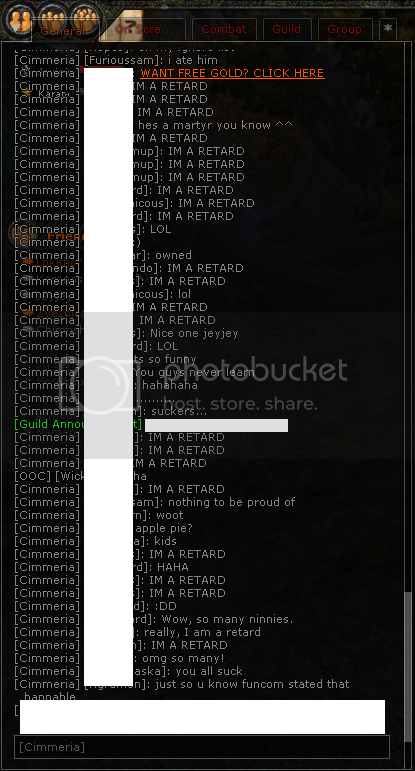 I just owned the whole Cimmeria channel!. Last edited by Biscis; 06-22-2008 at 03:43 PM. If you named that as color.txt you could run this as "/color.txt Your text here" Every % represents the next word. %1 is the first word, %2 is the next one, etc etc. I cant make the first one to work. Removed /chsay. It only works if i dont use space. Also giving out Parog +Rep for some of the scripts hes made too. Thanks for to both of you. You must spread some Reputation around before giving it to Glitchy again. it should work, but the colored > keeps ****ing it up, any ideas people? whats happening is the the href link stops at the first >, i want it to stop at the last one, how can i break it off? 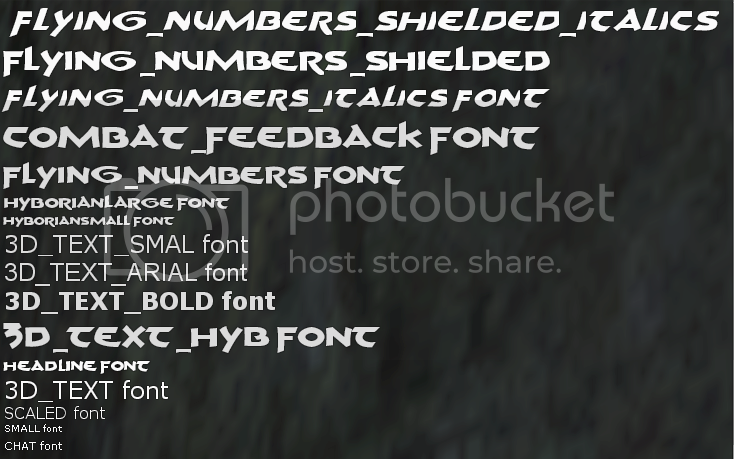 not sure of any other font faces out there, but will try to find some, found this from a friend, maybe some are STYGIALARGE? Some Fun I had with the Script Bug in the exploit section.